I can make coffee... it's that black ground stuff you add water to, right? Just kidding. Of course I know how to add the grounds to the filter and the water to the compartment allotted for precisely that liquid. Trouble is, I can't really seem to make good coffee... and it bothers me. I should start by saying it isn't my "job" to make coffee--it is my husband's "job." This isn't rocket science. It's coffee! Which, apparently, is not my strong suit. It's a little ironic, but still sad any way you look at it. I like coffee, and I want to make it well! At first it was a listening issue... my husband told me I needed four scoops of coffee and I disregarded this, insisting it just looked like too much coffee. After drinking the coffee-water that resulted from my three scoop coffee incident, I was more inclined to agree with him... so one would think the coffee would get better. On mornings when I wake up first (which are fewer than one might imagine), I make the coffee. It's not because I want to make the coffee, but I am up, so hey. We recently purchased a coffee grinder, and so I added the beans and I ground the coffee. I measured those four scoops and proceeded to make the weakest coffee known to man... or at least the man in my house. I tried my best to sip it and be like, "It isn't that bad," but the only person I was lying to was myself. I was irritated (once again) with my weak coffee skills; and, no, it wasn't the coffee itself that was weak because the guy at the store told us it was the "right" coffee for us. The point is, I need help! 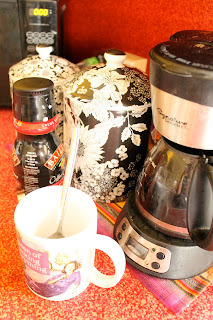 Because forcing my husband to drink one more pot of coffee that tastes more like chicory and dirt is just wrong. I mean, when your day starts with crappy coffee, you just aren't in a great place... and I want to improve my coffee making skills. So help a Bossy Italian Wife out, here. Give me some coffee tips! -I recently purchased a grinder for whole bean coffee... is whole bean coffee supposed to be stronger because it seems to always taste weaker for some reason?! -My husband, who hates my coffee although he has never directly come out and said it, thanks you. Hi Billie! Try 4 heaping scoops instead of flat scoops and throw in a teaspoon or two of ground cinnamon. Thanks Emily!! I DO love the cinnamon in it! DELISH!